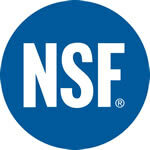 The PureMaster™ V-Series™ V-500™ Replacement Media includes two bags of NSF® certified high-grade PureCarbon™ and PureCat™ water filtration media weighing a total of approximately 45 pounds. 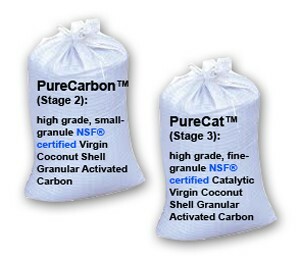 PureCarbon™ is a high-grade, medium-granule NSF® certified Virgin Coconut Shell Granular Activated Carbon. 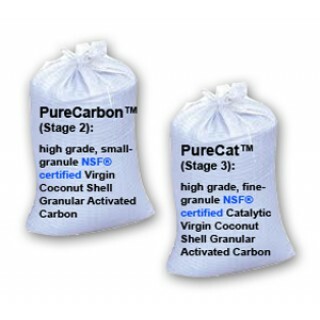 PureCat™ is a high-grade, small-granule NSF® certified Catalytic Virgin Coconut Shell Granular Activated Carbon. For more information about the PureMaster™ V-Series™ V-500™ Premium Whole House Water Filtration System, please see the PureMaster V-Series V-500 (Complete System). V-Series filtration media necessary for the different stages within the V-500's blue tank unit, and a filter media filling/refilling funnel. Please note that this Replacement Media option is for existing V-500 system owners. See the Vitasalus V-Series V-500 Replacement System. The Vitasalus/Equinox Products PureMaster™ V-500™ Premium Whole House Water Filtration System utilizes high grade NSF® certified water filtration media and components/parts/materials (per NSF/ANSI Standard 61) and tank (per NSF/ANSI Standard 44).